The US National Conference begins on Wednesday, July 6. 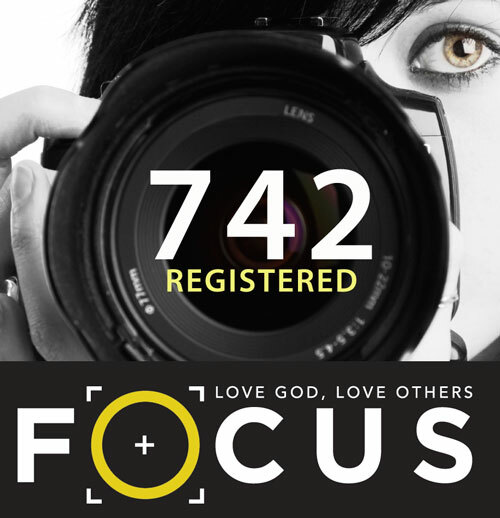 As of Thursday, June 30, we have 742 people registered. We’re very pleased with that number. 372 signed up for the Friday morning workshops. 43 signed up for a special luncheon Thursday with IN Network, to talk about ministry in Turkey. 12 signed up for a special luncheon on Friday with Renew Communities, a church plant in the Cleveland area. We’re looking for more people to participate in the National Conference choir. If you’re attending the US National Conference next week, and would like to participate in the choir, send a note to Chris Kuntz [email removed]. The choir will practice on Friday afternoon, 1:30-3:30. The National Conference site has complete information, including the song list and music. Many of you remember Alan and Doris MacDonald, who were endorsed Global Ministries missionaries with Wycliffe for many years. We just received word that Doris’s mother, Dorothy Au, passed away on June 29, 2011. The MacDonalds currently live in Virginia, where Alan is Pastor of Global Engagement at Fairfax Community Church. Pastor Jaime Chun and his wife may have a tiny model of the church building they are erecting, but they have a huge vision and an immense love for the people of their community in Guatemala. In 2000, they began this church plant using their musical gifts to draw a crowd. They sacrificed their time and comfort in order to spend time infiltrating their community. The Chuns have lived by faith along with their four children in just two rooms, one as a living space and the other as a bedroom for the entire family. Yet they are always joyful and ready to bless those they meet. Although unemployment in their area is at 50% and most only work seasonally in the sugar cane fields, the congregation of 80 has purchased a 9×16 meter lot and constructed one level of what they hope will one day be a three-story ministry center. They are working in stages, so the project has been broken down as $5000 for the second floor, $7500 for the third, and another $7500 to finish the entire structure, interior, etc. Much of their focus is on children’s ministry. Since many cannot attend school, they offer education as well as spiritual care. They hope to even provide housing to orphans as the Lord provides. If a team would be interested in assisting, it would be best to plan on traveling sometime between October and April to avoid the rain. Accommodations would be very basic, but love would be provided in abundance. Teddy Fairchild has been appointed senior pastor of The Rock (Findlay, Ohio) effective July 1, 2011. Valerie Reynolds resigned as senior pastor of Mount Hope UB (Carson City, Mich.) effective June 10, 2011. Howard Matthews resigned as senior pastor of HomeFront Church (Grandville, Mich.) effective June 27, 2011. Renew Communities, a church plant in the Cleveland, Ohio, area, has been collecting supplies for victims of the tornados which struck Alabama in April. Their hope is to fill a 50-foot semi trailer and send it to the Holt Relief Center just outside of Tuscaloosa, Ala. Renew started in April under the leadership of Andy Sikora, and has been averaging 90-100 people. The church was recently featured in the Cleveland Sun News. That article is printed below, with permission. Joanne Berger, Sun News Staff Writer. A local congregation is seeking donations to help victims recover from the devastating tornadoes that hit Alabama in April. Members plan to fill a 50-foot semi-truck trailer with the donation and deliver them in July. Andy Sikora, a Berea resident, is lead pastor with Renew Communities, which meets in Polaris Career Center each Sunday. The congregation has partnered with SEKO Worldwide, a freight forwarder firm in Cleveland, in organizing drop-off locations. Sikora said the church, which is about 3½ months old, is “passionate” about helping those in need. Some of the needed items include cleaning supplies, canned goods, washing detergent, undergarments/socks, lamps, blankets, linens, pillows and toilet paper/paper towels. Rob Musial, SEKO’s inbound freight manager, said his company was looking for a project in which to get involved. Musial, a Renew member, said Sikora contacted him about the same time in finding a way to transport the donations. It was perfect timing. Allison Connors, a Berea resident, spent a few hours outside the Berea Recreation Center last week accepting donations. She said Ohioans can relate to what occurred in Alabama with the heavy storms and flooding experienced recently in this area. Berea’s recreation center is located at 451 Front Street. Middleburg Heights Community Center is at 16000 Bagley Road and Polaris, 7285 Old Oak Blvd., Middleburg Heights. Bishop Emeritus Raymond Waldfogel (bishop 1969-1981) is currently in Huntington Parkview Hospital (Huntington, Ind.) with lots of fluid in his lungs. He’ll probably be there through the end of the week. Please remember Ray and Wardena Waldfogel in your prayers. Cards can be sent to: Raymond Waldfogel, 2002 North Ave., Huntington, IN 46750. 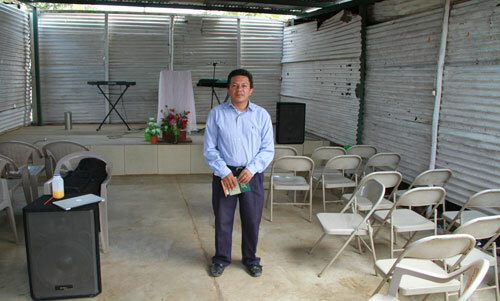 Pastor Basilio in the Colonia la Estancia building. When the church plant began in La Estancia, Pastor Basilio was driving back and forth some two hours from Guatemala City to Escuintla. In the process, he and his family of seven lost their home in the city due to a lack of finances. Today, they live in a very basic shelter next to the church plant. Although unemployment in their area is at 50% and most only work seasonally in the sugar cane fields, the congregation of 60 has purchased a 6×15 meter lot on which they built a picnic-style shelter where the congregation gathers. In order for the building to be improved, footers need to be poured, walls constructed, and a roof installed. They calculate that it would cost $8000 to make the improvements on the property. A team would be welcome but would need to recognize that their accommodations would be quite rustic. If you’re up for that kind of challenge, the best time would be during the month of September. Workers are laid off from May until October, and rain is heavy during the summer months. The members of the church can’t offer much, but are willing to volunteer alongside a work team. Donna Hollopeter with the teens from Germany (click to enlarge). Galen and Maritta Fiedler, non-traditional staff with Global Ministries, brought a group of 18 teens and 2 chaperones from the Aloys Henhofer School in Germany. They spent the week of June 13 participating in the regular teen camp at Camp Cobutic in Bellafontaine, Ohio. They are now spending six days visiting Huntington University. During their time in Indiana, they’ll visit Shipshewana, the Fort Wayne Zoo, and get a special tour of the Indianapolis Motor Speedway. In the mornings, Donna Hollopeter is offering some fun English learning activities. Donna was among the first to receive a TESOL Certificate (Teaching English to Speakers of Other Languages) from the Institute for TESOL Studies at Huntington University.